This topic details which images do and do not require the virtio driver to be installed on the source server before import. You can skip to recover the temporary root file system of initramfs or initrd. For Linux images that are not included in the preceding list, you must install the virtio driver on-premises before importing the images. Run grep -i virtio /boot/config-$(uname -r) to inspect whether the virtio driver is already built in the kernel of your server. If VIRTIO_BLK and VIRTIO_NET do not exist in the output, the virtio driver is not built in the kernel. You must install and configure the virtio driver on your server to compile and install virtio driver. If the values of parameter CONFIG_VIRTIO_BLK and parameter CONFIG_VIRTIO_NET are y, the virtio driver is already built in the kernel. For more information, see notes for importing images and import custom images. If the values of parameter CONFIG_VIRTIO_BLK and parameter CONFIG_VIRTIO_NET are m, continue to step 2. Run lsinitrd /boot/initramfs-$(uname -r).img | grep virtio to make sure the virtio driver has been complied in the temporary root file system of initramfs or initrd. According to the preceding figure, the virtio_blk driver, including its dependency virtio.ko, virtio_pci.ko and virtio_ring.ko, has been compiled in the temporary root file system initramfs. For more information, see notes for importing images and import custom images. If virtio driver is unavailable in the initramfs, you must recover the temporary root file system of initramfs or initrd before importing images or migration. Run yum install -y ncurses-devel gcc make wget to install necessary components to compile the kernel. Run uname -r to query the kernel version of your server, such as 4.4.24-2.a17.x86_64. Visit published Linux Kernel Archives to download the source codes of kernel, for example, the download link of kernel version starting with 4.4.24 is https://www.kernel.org/pub/linux/kernel/v4.x/linux-4.4.24.tar.gz. Run cd /usr/src/ to change the directory. Run wget https://www.kernel.org/pub/linux/kernel/v4.x/linux-4.4.24.tar.gz to download the installation package. Run tar -xzf linux-4.4.24.tar.gz to decompress the package. Run ln -s linux-4.4.24 linux to establish a link. Run cd /usr/src/linux to change the directory. Run the following commands to compile the driver into the kernel. 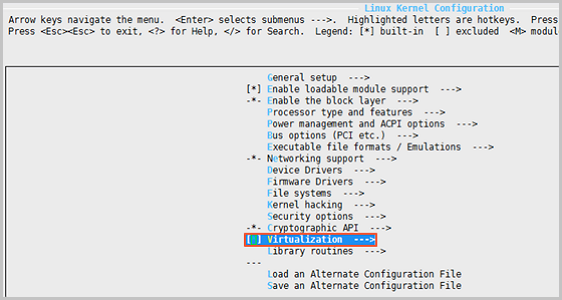 Note Select * to build the driver in the kernel, select m to compile it as a module. Press the space bar to select Virtualization. Make sure that you have selected the option of KVM (Kernel-based Virtual Machine). Press the Esc key to exit the kernel configuration windows, and save changes to file .config according to the dialog box. Inspect whether all the corresponding settings of virtio driver has been correctly configured or not. (Optional) If no configuration of virtio driver is settled after the inspect, run the following commands to edit the file .config manually. Run the following commands to check whether the virtio driver is installed. Note If any of the output includes virtio_blk and virtio_pci.virtio_console, your server has correctly installed the virtio driver. After compiling the virtio driver, you can migrate your server to Alibaba Cloud by using the Cloud Migration Tool.